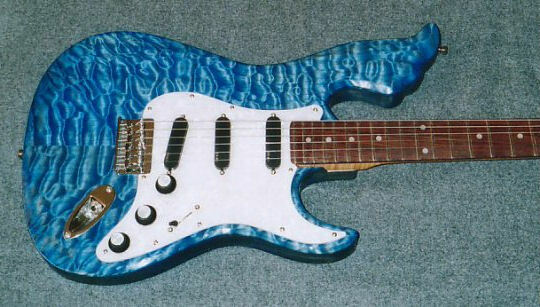 The 'Blue Magnet' is a one-of-a-kind model, which has been specially designed and custom-built to the specifications of Blues Icon, Mr. Blue of Switzerland using the finest quality tone woods. Some of the outstanding features of the 'Blue Magnet' include AAAA grade quilted maple top, finished in a gorgeous transparent blue, with maximum grain enhancement. The spectacular upper horn design and equally striking headstock, based on a copyrighted concept by Mr. Blue, enhance the beauty of this extraordinary instrument, while the EMG Active Pickups complete the package. If you can dream it, I can design and build it! 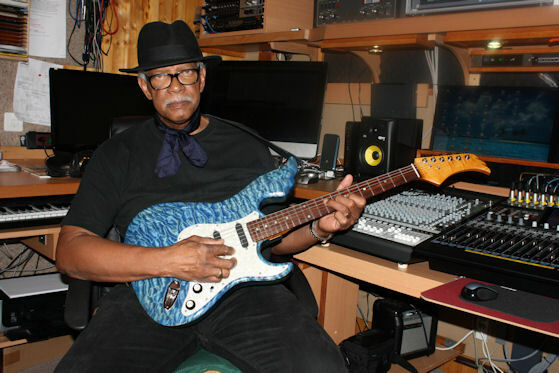 You can hear this Blues Powerhouse on the CD "Blues Dancer" by Mr. Blue & the Tight Groove. Beautifully carved mahogany body and gorgeous quilted maple top. Specially shaped flamed maple neck with rosewood fretboard, with a finish that brings out the natural feel of the wood. Neck fitted with 2-way internal adjustable 'Hot Rod' truss rod for maximum stability. 22 high quality medium frets. 3 EMG single-coil Active pickups (SA Set) powered by 9-volt battery. Master volume control, 2 tone control, 5-way pickup selector switch and stereo output jack. White pearloid pickguard and black control knobs with white pearl caps to match the white pearloid pickguard. Mr. Blue's initials engraved in interlocking monogram on the neck attachment plate add a personal touch. Chrome-plated brass bridge with fully adjustable saddles. Grover Mini guitar machine heads, with 14:1 gear ratio. Transparent blue colour, spray-finished with ColorTone High-Gloss Professional Guitar Lacquer.